Say hello to the best summer meal ever. Ugh. This is fantastically fantastic. How was your weekend? Mine was full of chunky babes and so much chocolate frosting that I may never eat a brownie again. Also: cheeseburgers. Happy Mother’s Day to me. My one request was to not have to unload the dishwasher. Worst.chore.ever. It was hot and summery and sunny and beautiful. I made grand plans for flowers and herbs which I will inevitably kill and played with coral nail polish with rose gold glitter and wore hot pink mirrored sunglasses and wondered if little girls still play Mall Madness and sat outside and sneezed my face off and it all felt GOOD. I’m currently working on an embarrassing summer playlist (because, uh, hello I’m 64 years old) AND a summer bucket list. A real one this time. Not like last year’s, which I had to half-fake since I was secretly oh-so knocked up. So do you want to, like, talk about salad? Neither do I, but this is a good one. Promise. 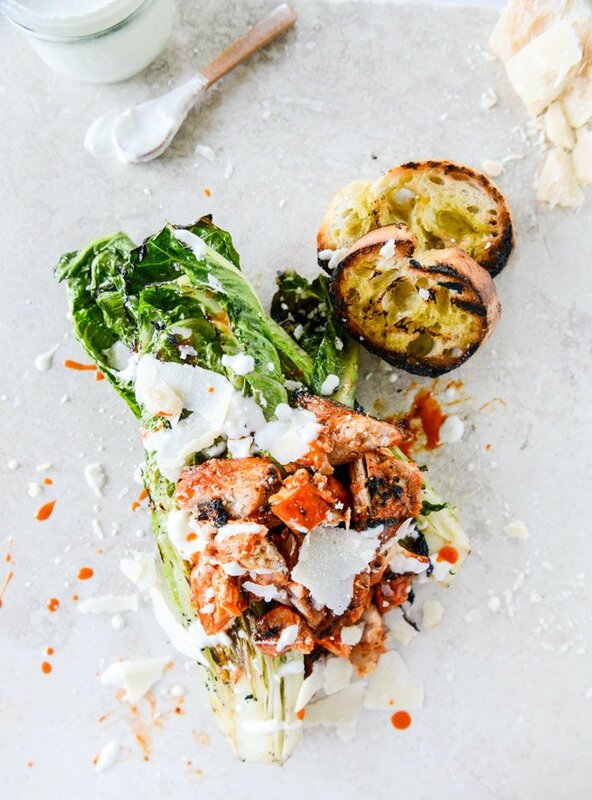 It’s no secret that we are crazy over grilled romaine. Grilled greens in general is a surefire way that I will get greens in – I just wish we could do it every single day. Quickly charred lettuce sounds ridiculous but if you’ve never tried it, you’re totally missing out. Seriously. The secrets are: a super screaming hot grill – pretty romaine stalks, cut in half so there is a “flat” side and drizzled with a little oil and lots of salt and pepper – fastfastfast grilling time. Easy! But you HAVE to do all of them. If so, you are on your way to smoky lettuce heaven. 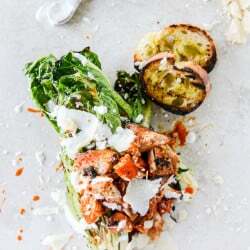 The ONLY (and I really mean only) way I thought that our regular grilled romaine Caesars could get better was by adding buffalo chicken. Grilled buffalo chicken, of course. Grilled buffalo chicken THIGHS, of course. Yep. Still so riding that train. Making boneless, skinless thighs every single weekend for some meal prep and every single week for at least one dinner. Holy flavor. The dressing here is a parmesan greek yogurt dressing which I first made a few years ago for these roasted corn Caesar salads. It’s FAB. It works on so many salads and also as a little dip for things like raw veggies and what not. If you’re into that freaky stuff. To round things out, aside from a few large shavings of cheese, are huuuuuuge croutons. Basically some grilled garlicky baguettes. Chop them into croutons, dip them in the salad, do what you want. Because you’re lovely. This is a salad you do NOT want to share. In a small bowl, stir together the paprika, garlic powder, onion powder, salt and pepper. Rub it onto the chicken thighs evenly. Place the chicken on the grill (preferably on one half side of the grill, so you can use the other half for the romaine and the bread) and cook until it is cooked through, about 8 to 10 minutes, flipping once or twice in between. While the chicken is cooking, heat the buffalo wing and butter in a small saucepan over low heat. Whisk until the butter is melted. When the chicken is almost finished, brush the buffalo wing sauce over each thigh. When you remove the chicken from the grill, brush more sauce on and then let the chicken sit for 5 minutes or so. Slice it or shred it – however you want to serve it! While the chicken cooks, drizzle the sliced side of the romaine with a tablespoon or so of olive oil (per each sliced stalk). Sprinkle on a pinch of salt and pepper as well. Rub each baguette slice with the garlic cloves on both sides (you may not need both cloves) and drizzle the remaining tablespoons of olive oil on top. I like to grill the bread first because the romaine needs to be served as quickly as possibly after grilling. If you have an open side of the grill (or once your chicken is finished), place the bread on the grill and grill each side for 1 to 2 minutes, until golden and grill marks appear. Place the romaine stalks on the grill, cut side down. Grill for 1 to 2 minutes, until the lettuce becomes charred, then flip over for an additional minute. To serve the salads, place one or two stalks on a plate. 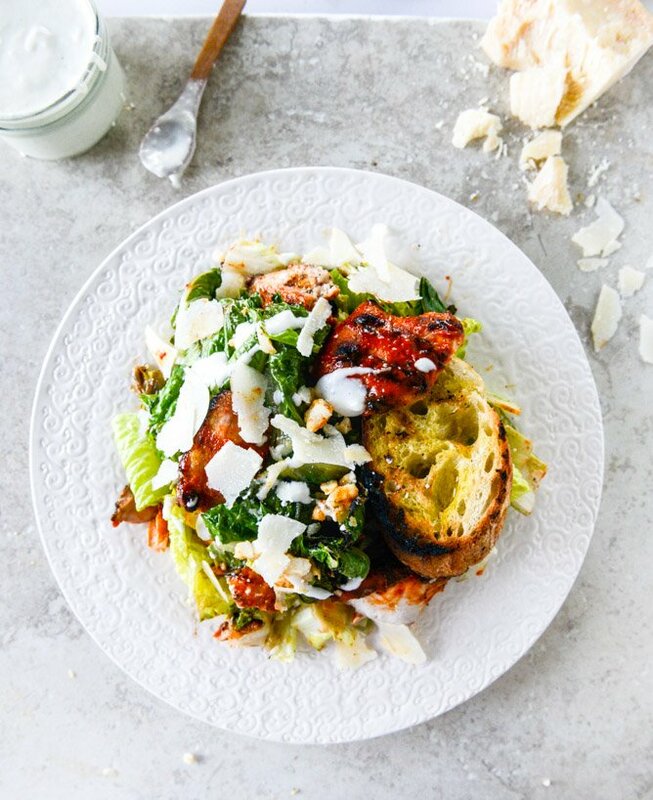 Drizzle on some of the dressing, then top with the buffalo chicken. Drizzle on a little more dressing! Shave some parmesan on top. You can, of course, drizzle on extra wing sauce, crumble blue cheese on top or add scallions or chives. You can serve the grilled bread on the side or cut it up to make croutons. You can also slice the lettuce and serve it as a chopped salad. Totally up to you! EAT UP. P.S. yes, of course, you should add bacon. Duh. Absolutely loved this! Definitely a keeper. Thank you! The only change I made was to sub capers for the anchovies in the dressing. Yum!